Good News: DOST said that the Philippines will have Free Wifi internet nationwide (public places) starting July 2015. The free internet wifi will have at most 256 kbps speed (maybe in the future it will become stronger and they will allocate bigger data and speed.). Places where broadband Wi-Fi hotspots will be installed include plazas, schools, hospital, piers, government offices, and airport terminals. 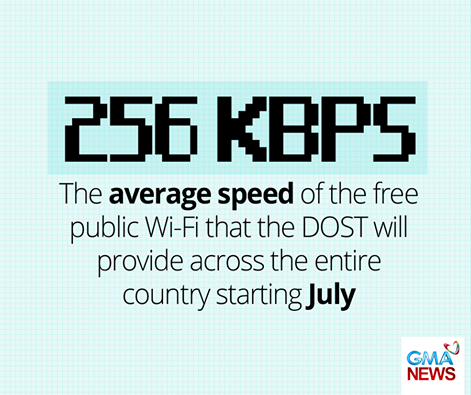 The average speed will be 256 kbps, reports Bam Alegre on State of the Nation with Jessica Soho. Department of Science and Technology (DOST) project. “Kaugnay nito ng karapatan ng mamamayan sa impormasyon. Lalo na impormasyon na nanggagaling sa gobyerno,” said Edgardo Cabarrios, NTC Director. “Kasi kung may free Wi-Fi, ma-access nila yung mga information na dapat iparating sa kanila.” Cabarrios added that there will be data-capping to prevent users from abusing the free Wi-Fi. According to IT experts, this project will be able to help people in provinces with education, especially in since they will have access to government databases. It also offers a cheaper alternative to long-distance phone calls. The fact that the Philippines is an archipelago will pose some problems for the implementation of the project. According to IT expert Philip Cheang, before other countries with nationwide free Wi-Fi deployed their projects, their private Internet services were already fast to begin with.